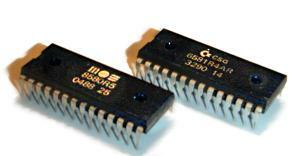 The CSG 65CE02 is a 8/16-bit microprocessor developed by Commodore Semiconductor Group in 1988. It is a member of the MOS Technology 6502 family. The Peripheral Interface Adapter (PIA) is a peripheral integrated circuit providing parallel I/O interfacing capability for microprocessor systems.